Mockup of a 1.8 m square (6 x 6 ft) afghan done in checks of modular and st st squares. Sl2tog = slip 2 sts together. Insert your needle into the next 2sts as if you were going to knit them together, but slip them onto the right hand needle instead. Cast on 66sts and work in st st for 30cm/ 12 inches. Cast off. 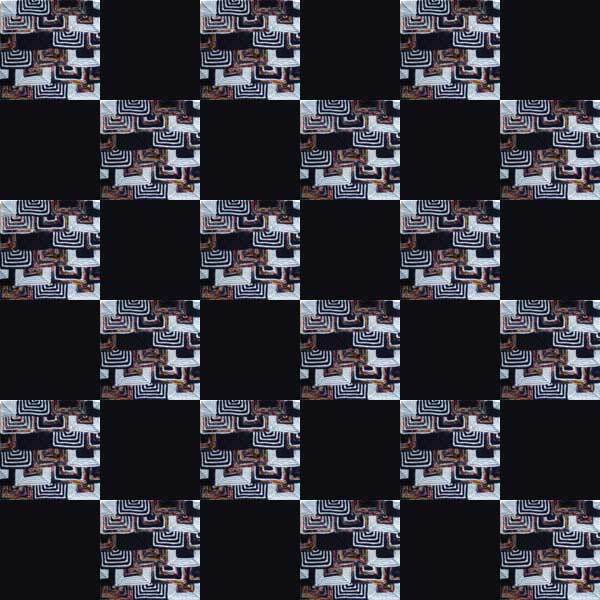 Work all modules in random stripes. Note: My square measured 11 inches square while knitting because of the way the modules pull in along the seams before blocking, but when blocked it was 12 inches square. Sample square is 100% wool and was blocked by washing and steam ironing. Begin with rectangular module 1 (number 1 on the chart above). 1st row: (Wrong side facing) * Knit 1 row. 21st row: K2 tog, cut yarn and fasten off. Pick up 11sts along the left hand side of rectangle 1. Cast on 31sts. Turn, and work as for rectangle 1 from *. Pick up 11sts along the left hand side of rectangle 2. Cast on 31sts. Note: If you want to work your whole afghan in modular knitting, keep adding more rectangles until your blanket is wide enough. When your first row of modules is wide enough, continue with the next row of modules, beginning with square 4. Pick up 10sts along the left hand side of square module 4, 1st in the corner, 21sts along the top of rectangles 1 and 2, cast on 10sts. Pick up 10sts along the left hand side of rectangular module 5, 1st in the corner, 21sts along the top of rectangles 2 and 3, cast on 10sts. Cast on 10sts, pick up 22sts along the top of modules 4 and 5, cast on 10sts. Work as for rectangle 1 from *. You should now be able to work the remaining modules following the order in the diagram above. Darn in all your loose ends on the back of your work. 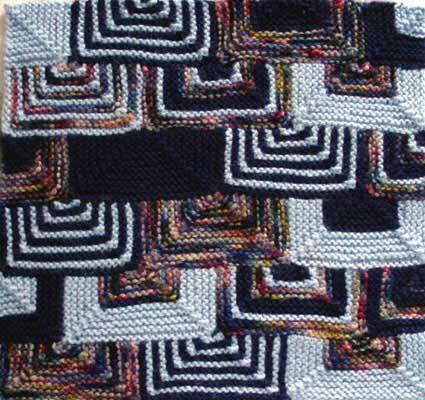 If you have worked your afghan in squares, sew them together using a neat back or mattress stitch. You now need to decide how to finish your edges. You can work double crochet (US single crochet) all round, pick up sts and knit a border, or pick up sts all round and work attached icord. Copyright Sarah Bradberry November 4th 2003. All rights reserved.